Does your groom have striking blue eyes? If so, help him look and feel his absolute best on the big day by choosing our men’s titanium wedding band with two blue enamel inserts. This ring was designed to impress and features no shortage of sophistication. The two blue inserts create a wonderful two-toned effect against the lustrous sheen of titanium. This alternative metal is beloved by many, because it is affordable compared to platinum, palladium, or white gold. Each men’s titanium wedding band with two blue enamel inserts we offer will withstand the wear and tear of his demanding daily grind. Titanium boasts one of the highest strength-to-weight ratios of all transition metals, but it will also resist denting, discoloring, and scratching for years to come. Finding someone to spend the rest of your life with is no small task, but choosing a ring to wear eternally doesn’t have to be. 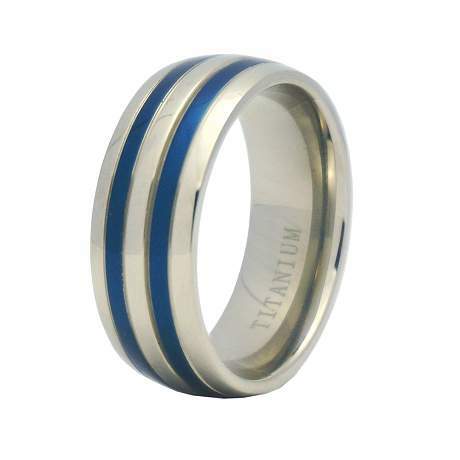 The men’s titanium wedding band with two blue enamel inserts is subtle yet show-stopping. Each blue enamel insert is accentuated by polished edges that will gleam just as much as his smile as you walk down the aisle. We designed this wedding ring in the comfort-fit style, which can easily squeeze over large knuckles. Comfort-fit rings usually measure a half size smaller than traditional wedding bands, so we recommend that he have his finger sized for accuracy to ensure that the comfort-fit style is right for him. If you have any questions about this ring or need help along the way, please contact us today for further assistance. I bought this ring for my husband with a sentimental meaning behind it. As it turned out, I must have sized it wrong and it was too small. I put it on my middle finger and absolutely LOVED it! So now I will order his size, (prayerfully) and this will make a great set!